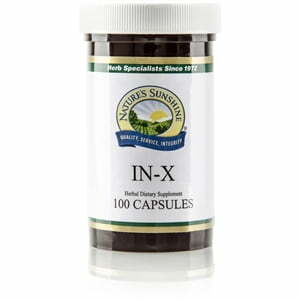 Nature’s Sunshine IN-X formula combines herbs known for their digestive nourishment and immune system supprt. 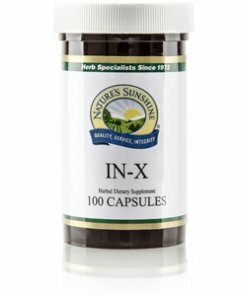 Golden seal, black walnut hulls, althea, parthenium, and bugleweed all come together to in one powerful capsule. Golden seal, champion of the immune system, balances the microbiological environment of the immune system while parthenium, similar in properties to echinacea, further nourishes the immune system. Black walnut hulls cleanse the body’s systems, and the mucilage in althea provides mucous membrane support. Plantain nourishes tissue health, and last but not least, bugleweed provides respiratory support.